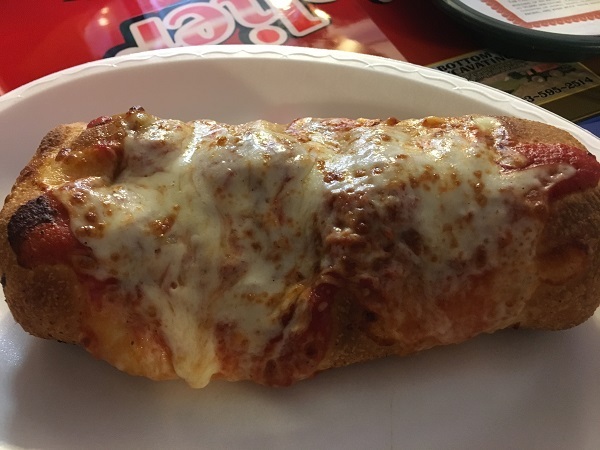 Gondolier Pizza, Chattanooga TN – Marie, Let's Eat! “Pizza” is in the name, but not in this story. We’ve picked up inexpensive pies here a few times for a quick dinner, but wanted to come back and explore some of the other things they offer for a Sunday lunch earlier this month. Sometime late last year, Marie suggested I bring home a pizza for dinner, and I looked around for a quick, inexpensive option. 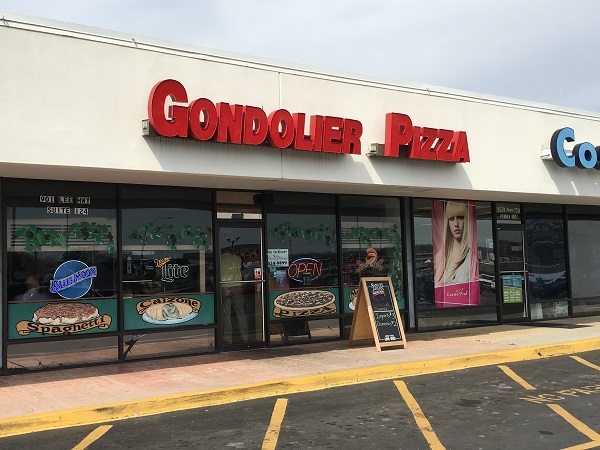 We’d never noticed it, but there’s a place called Gondolier about two miles from our house. I’d mentioned this chain in the blog once before. A little over two years ago, I wrote about an Italian-American restaurant in Tullahoma called Gondola Pizza House. There are a few of these here and there in middle Tennessee, all forty-odd years old, all claiming no connection to the others. The similarly-named Gondolier is a chain that also started about forty years ago with a few places in eastern Tennessee and north Georgia. One of the employees of the Lee Highway Gondolier explained that while he doesn’t believe there’s any connection to any Gondola, some members of the family that runs Gondolier do run a very similar chain called Rafael’s, with three locations around Chattanooga. The one in Hixson is in a very nicely preserved “mission” style Taco Bell building. Gondolier’s pies are okay. They have a buy-one-get-one free deal, so every once in a while I’ll bring home two small pies for us to share. It doesn’t cost very much, and it’s better than a national chain. It’s not a patch on Lupi’s, but it’s all right. One evening earlier this month, while I was waiting for our pies, I looked over the rest of the menu. That Gondola in Tullahoma we visited in 2014 was said to have better calzones and other things than their pies. I wondered whether that would be the case here as well. Marie ordered a meatball stromboli and I had a gyro plate, which came with a salad that was a bit heavy with iceberg lettuce. I’m not going to pretend that these were worth stopping everything and driving to Chattanooga or anything, like Bolton’s is, but these were each pretty good. The stromboli was as greasy as one would expect, and probably the least healthy thing Marie’s eaten all year, but they make good meatballs and it’s served with a cup of a tasty tomato sauce. My plate was stacked precariously high with food, and came with more than enough fries for everybody to share. 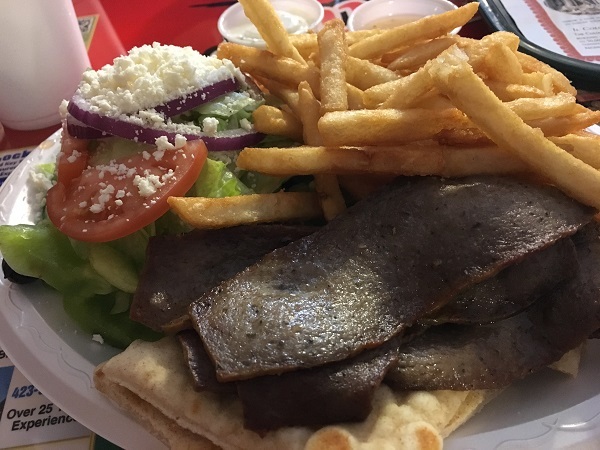 The gyro meat was very tasty, and I enjoyed it. This was not a bad lunch. All of the Gondoliers and Gondolas, whatever their origins and lineage, have pretty basic menus of Greek-Italian-American meals. They’re simple places for families or groups and do a good portion of their business in carry-out orders. This is a reliable, fine restaurant that we’re certain to revisit from time to time. Posted on March 31, 2017 by Grant G.Posted in chattanooga, italian, regional chains, tennesseeTagged chattanooga, italian, regional chains, tennessee. We go to a Gondolier restaurant in Sevierville every year when visiting the Pigeon Forge area. I stumbled across it several years ago through Trip Advisor. They have really good pizza and lots of big shareable desserts. I also like that they bring out breadsticks and marinara sauce when you first arrive to give everyone (especially the kids) something to munch on while ordering and waiting for the food to arrive. We didn’t get complimentary breadsticks here. That’s one up for Sevierville, I think.